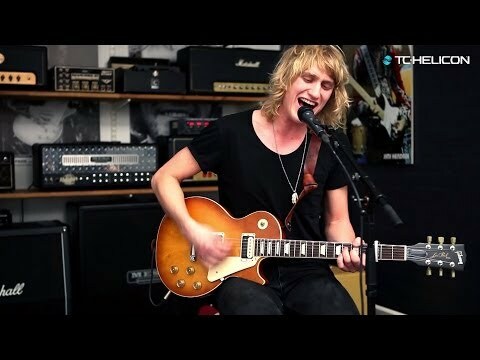 Vocal harmony and effects processor that offers TC-Helicon’s most comprehensive Vocal FX suite, legendary Guitar FX from TC Electronic with new amp emulations, and 3-phrase loops for creating entire songs. It provides 250 factory presets with 10 steps for preset and Genre and Style categories, memory for 500 presets, 10 control footswitches with 6 of them preset-assignable for enabling/disabling FX blocks. Vocal FX section offers µMod, Echo &amp; Delay, Reverb, Harmony, Double Transducer, Rhythmic, HardTune &amp; Correction, Choir, Stutter, Vocoder and Adaptive Tone effects; Guitar FX features Amp Modelling, Drive, Delay, Reverb, Compression, Resonant Filter, Wah, µMod (Flange, Chorus, De-tune), Shifter, Rhythmic/Tremolo and Talkbox (part of Vocoder) effects. Processor features an anodized extruded aluminium and steel chassis with rubberized edit/mix knobs and recessed rubberized handle, 192 x 64 Blue STN LCD with white backlit display, tri-coloured Footswitch Light ring and capacitive touch edit controls with LED indicators. It provides a combo balanced XLR/balanced TRS 1/4" phone input and output jack for microphone, 1/4" phone jack input and output for guitar, balanced XLR input for monitoring and 1/8” stereo mini jack aux input, as well as a 1/8” mini stereo headphone output, a buffered guitar input, USB A and Mini-B port, 5-pin DIN MIDI in and out, and 1/4” TRS phone jack for pedal connection. USB cable and guitar/headphone combo cable are included. Dimensions: 76 x 350 x 216 mm. Weight 2.3 kg. 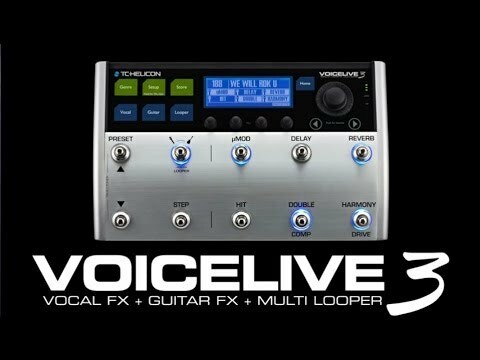 Do you own TC Helicon Voice Live 3 or have you had a chance to try it?